One of the things you always hear as a rap on reading news online is that it's missing the serendipity that makes a print newspaper such a good experience—turning the pages and stumbling upon a great story on a topic you knew nothing about. I don't buy that argument for a lot of reasons—links, blogs and RSS feeds give me more serendipity and choices online than I ever see in print—but I think one good reason for that complaint is that most news Web sites are completely clueless about how people use the Web. The problem: Most news sites are a collection of vertical cul de sacs. You click on a headline, read the story...and you're left with virtually nowhere to go when you're done reading. At that point, you've got to hit the Back button and return to the home page or section page or whatever to choose something else to read. More likely, you're just going to leave for another site. You're not given a lot of choice to stay. This phenomenon is exacerbated by the fact that most traffic to news Web sites comes in through a side door, as it were, not from the home page. Readers find news articles via search or links from elsewhere, get to those pages...and are stranded. It's a pretty terrible experience, and it's amazing how many news sites are designed that way. If there are links at all, they usually are to related items, inserted by editors/producers, which is labor-intensive and thus fairly rare, especially on routine stories. The alternative to these dead ends is what's called horizontal navigation. Give the reader a variety of choices of places to go at the end of a story. Indeed, treat every story like it's a proxy for the home page, with as many inducements for a reader to stay on the site as possible. The recent appearance of lists of most-viewed and most-e-mailed stories on many sites is a step in the right direction. But it's still not enough. This is a really sharp improvement in reader experience and an excellent way to produce additional page views. The logical—and easy—extension to make each page more like a home page is to add a list a of top stories from the home page and section front to each story page. ChicagoTribune.com had something vaguely similar a few years ago, though for some reason it appeared only on sports stories. The Tribune site listed top news stories, weather forecasts, etc., even the latest Dow Jones numbers, at the bottom of each sports story. Alas, it seems to have disappeared in the site's latest redesign. 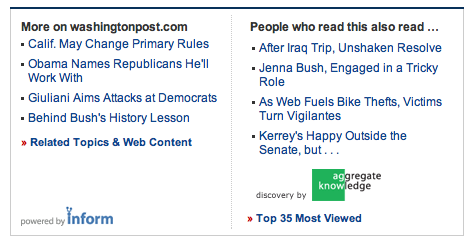 Washingtonpost.com is really pointing the way here in thinking about horizontal navigation on news sites. If you want to keep readers around, you've got to give them multiple reasons to stay—not lead them into a frustrating dead end. If someone is coming to your news site from a search engines, you know what their intent was. If they did a search for "iraq war", you can skew the links to other stories about the war. Since I linked to it from my blog, they've written three more stories on the topic updating it. But there isn't an easy way to identify those. Rocky: That's really a terrific, simple idea about search terms--I wonder why more sites don't capture that search info and act on it. It's another simple way of auto-generating relevant horizontal content navigation. And I'd love to be able to track an ongoing--but obscure--story for updates. There are some crude ways to do that in Google News trackers and with RSS, but all news sites should give readers the ability to follow a story if they want. Re: showing updates to stories. First, the newspapers would have to make the effort to get updates on stories. Unless it is a sensational story, they just publish the initial criminal charge or claims in the lawsuit, say that the defendant, or his lawyer, wasn't "immediately available for comment" ...and that's it. If the person or company turns out to be innocent, too bad. The charges are in the newspaper archive and on Google forever.